In case you missed it, Feastly dipped its toe into the Chicago culinary market and made its debut with a PEPCID sponsored event in the West Loop on May 21st. 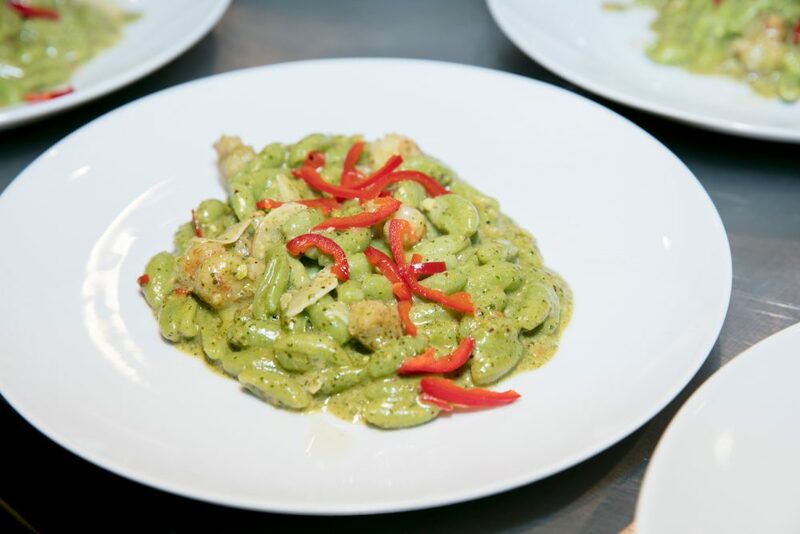 Top Chef Alum and cookbook author, Fabio Viviani of Chicago’s Bar Siena, Siena Tavern and Prime & Provisions, teamed up with Feastly and PEPCID to create a delicious evening meal full of spice and heartburn. On the menu was a refreshing watermelon salad with honeycomb, shaved radish and Nordic Creamery feta dressed in Calabrian chili yogurt and pistachio-mint vinaigrette; spinach cavatelli with rock shrimp, Fresno chile, braised leek, pistachio pesto and mint; braised short ribs with red wine risotto, gorgonzola and walnuts; and bread pudding with chocolate sauce and coffee gelato. After all of that, PEPCID was there to help prevent the imminent heartburn! What really made the night possible however, was the team at Feastly: “a central marketplace where passionate chefs connect with adventurous eaters”. Taking inspiration from international culinary experiences, Feastly founder Noah Karesh, created the marketplace four years ago in San Francisco with the goal to re-incorporate the home cooked meal into the social dining scene. Since then, Feastly has given countless chefs the opportunity to create a lasting, intimate bond with eaters. The dining concept often features notable chefs similar to Chef Fabio or even aspiring chefs, who open up their homes or private venues to whip up home cooked meals for curious eaters. Feastly introduces flavors to your palette while simultaneously bringing like-minded people into your life. The world of Feastly has launched in Los Angeles, San Francisco and Portland, with plans to officially launch in Chicago late 2018/early 2019. Right now, Chicagoans can get a sneak preview of the community and find four amazing (and coincidentally vegan) chefs on the Feastly Chicago website who have opened up their spaces to cook delicious food for their guests. Midwestern native, Chef Kevin Schuder, was the first to bring the market to Chicago. Chef Kevin, whose résumé includes time at San Francisco’s vegan-centric Millenium, recently made the move to Chicago and brought Feastly with him. After leaving a chef position in the Bay Area, a few of Kevin’s chef friends encouraged him to apply to Feastly. With more chefs and feasters joining the movement every day, Feastly offers a little bit of everything for every type of eater. From weekly, hosted meals to meals by request, eaters can enjoy whatever cuisine they desire for a reasonable price and meet like-minded people along the way. For more information on Feastly and how to join the Chicago dining scene, visit: https://eatfeastly.com/browse/?market=chicago.